In 1986, the two story brick building and its adjoing 60-foot-high, square tower were converted into a bed-and-breakfast. 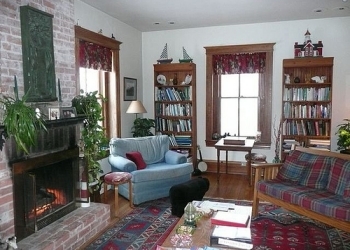 The 14-room inn has seven guest rooms with private baths, a common living room, and library, as well as a sauna. Guests enjoy all the conveniences of modern life with the exception of individual television and phones. In addition, more than three acres of lawn, 40 acres of woods with trails are at the disposal of guests. Climb to the lighthouse lantern, 120 feet above the lake surface. From this vantage point, visitors can survey open fields of native grasses and wildflowers, dense hardwood and pine forests, the majestic Huron Mountains looming in the distance and the ever-changing face of Lake Superior. The drama of offshore lighting-bolt dances, ice kaleidoscopes and dramatic gales, as well as the spectacle of the night sky and Aurora Borealis are breathtaking. Visitors can retreat below to the intimacy of the light house interior where everyone is encouraged to relax in front of the living room fireplace. The atmosphere is friendly, relaxed and casual. Guest rooms located on the first and second floor all afford a view. A good night's sleep is guaranteed, but early risers may be rewarded with close-up view of deer, raccoons, rabbits, foxes, wild turkey and other assorted wildlife feeding in the meadow at daybreak. 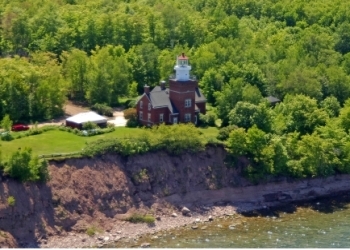 On the north shore of Michigan’s Upper Peninsula, William Prior was the original lighthouse keeper in 1896, but he may have never given up his duties. William, died over 100 years ago, apparently still insisted on “helping” around the inn. 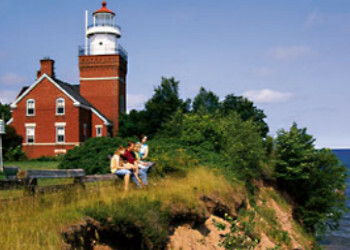 John Gale, Jeff Gamble and Linda Gamble are the keepers of the Big Bay Point Lighthouse. Like many guests, they fell in love with the site and became frequent visitors. In 1992 they took up residence. All three are former residents of the Chicago area and avid preservationists. they were actively involved in the restoration of the Frank Lloyd Wright Home and Studio in Oak Park, Illinois.